This pattern is available from etsy.com for $3.00. Meet the wombats. These guys are having a good time out of the burrow. 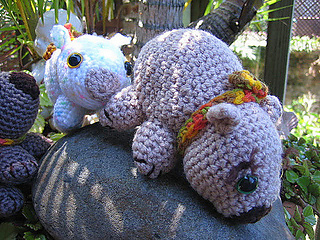 They are crocheted in worsted weight yarn, 8 ply or double knit with a 4mm hook. For a smaller wombat try a finer yarn - 4ply with a 3.5mm hook. They measure approx 5inches/13cm from the nose to tail. 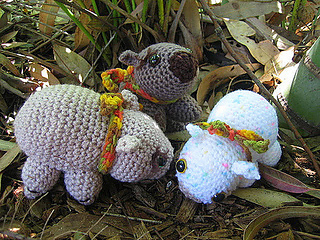 These are part of my Australian Amigurumi Marsupial Madness series. All of my patterns come in both Australian/British terms, and American terms. These little guys are great fun to make and are cute soft toys. 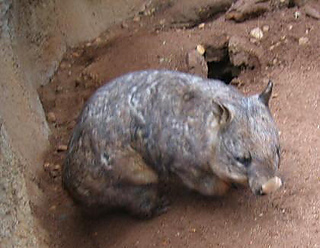 Wombats are stout, sturdy animals and live in burrows. Like the koala they are marsupials. They grow to about 1.3 metres in length, and can weigh up to 36 kg. They have a large, blunt head with small eyes and ears, and a short, muscular neck. Their sharp claws and stubby, powerful legs make them great diggers. The last picture is of a real wombat I snapped earlier this year. They are funny little critters! They dont get out much, but they sure have attitude. This is an original pattern and is copyright (c) crochetroo 2006, patterns are for personal ue only and may not be resold, reproduced or used to make items to be sold.